Fendol Farms will be a brand new Lennar community in Durham, North Carolina. Upon completion, the plans for this community call for 500 single-family homes of various sizes and floor plans. Located just 15 minutes from Downtown Durham and 30 minutes from Downtown Raleigh, residents of Fendol Farms will have endless opportunities for exciting entertainment, shopping, and fine dining. 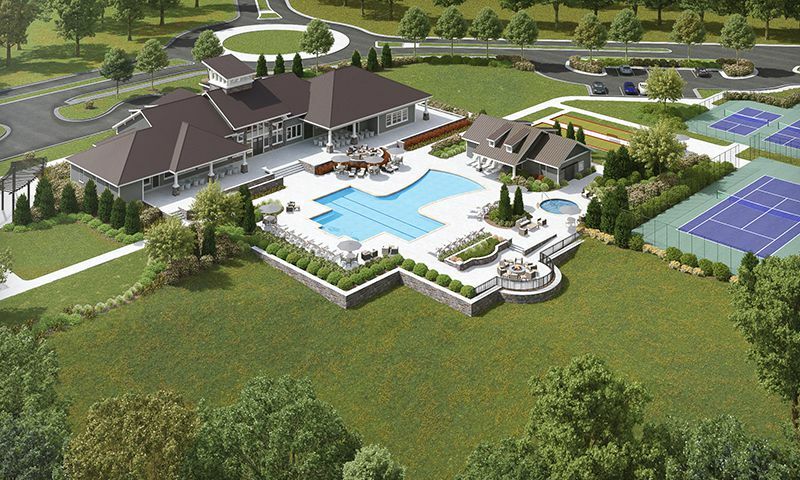 The community clubhouse will be where residents enjoy a fitness center, multi-purpose rooms for gathering with friends for fun activities, and a bar and grill patio for enjoying a drink with a bite to eat. Outside plans call for a swimming pool, bocce ball, pickleball, and tennis courts. A community garden will allow residents a chance to show off their gardening skills, and a dog park will be the perfect place to play with four-legged friends. Walking trails through the neighborhood’s parks and natural spaces will provide ample opportunity to get out and enjoy some fresh air. Lennar plans to offer three separate collections of homes in Fendol Farms that will appeal to a wide range of homebuyers. The Place collection includes four floor plans ranging in size from 1,436 to 1,816 square feet. They include two bedrooms, two bathrooms, and attached two-car garages. These homes come standard with 9-foot ceilings, quartz countertops, a choice of birch or maple cabinets, and more. The Residence collection includes three floor plans. These homes range in size from 1,816 to 2,090 square feet. They include two or three bedrooms, two or two-and-a-half baths, and attached two-car garages. These plans come standard with appointments like outdoor patios, carpeted family and bedrooms, and stainless steel appliances in the kitchens. The Manors include four floor plans that range in size from 2,041 to 3,619 square feet. These homes include two or three bedrooms, two or two-and-a-half bathrooms, and attached two or three-car garages. These homes include direct-vent gas fireplaces, designer tile backsplashes in the kitchens, ceramic tile floors in the bathrooms and laundry rooms, and buyers choice of hardware on all cabinets. Along with the many activities that will be available in this community, homebuyers will pay a homeowners’ association fee in exchange for additional conveniences like common area maintenance and lawn care for their homes. Instead of worrying about those things, you’ll be free to enjoy pickleball, tennis, and more with your friends and neighbors. Fendol Farms will be located in Durham, North Carolina. Residents will enjoy living in The Research Triangle of North Carolina, where daily necessities and exciting attractions are all around. Golfers will love living a short drive away from Brier Creek Country Club, Lonnie Poole Golf Course, 12 Oaks, Wildwood Green Golf Club, Falls Village Golf Course, and The Crossings. The community is also located less than two miles away from Brier Creek Commons, which offers shopping and dining. The community’s proposed location is close to Interstate 540 and State Road 70, which will make driving around the area easy. When traveling farther is called for, Raleigh-Durham International Airport can be reached in about 15 minutes. No matter what you love doing, you’ll find something to enjoy at Fendol Farms in Central North Carolina. There are plenty of activities available in Fendol Farms. Here is a sample of some of the clubs, activities and classes offered here. The Place collection includes four floor plans ranging in size from 1,436 to 1,816 square feet. They include two bedrooms, two bathrooms, and attached two-car garages. These homes come standard with 9-foot ceilings, quartz countertops, a choice of birch or maple cabinets, and more. 55places.com is not affiliated with the developer(s) or homeowners association of Fendol Farms. The information you submit is distributed to a 55places.com Partner Agent, who is a licensed real estate agent. The information regarding Fendol Farms has not been verified or approved by the developer or homeowners association. Please verify all information prior to purchasing. 55places.com is not responsible for any errors regarding the information displayed on this website.